Torres Novas (Portuguese pronunciation: [ˈtoʁɨʒ ˈnɔvɐʃ]) is a Portuguese municipality in the district of Santarém, in the Médio Tejo of the Centro region. The population of the municipality was approximately 36,717 (from the 2011 census), with the city of Torres Novas (seat of the municipality) has about 15,000 inhabitants in an area that econompasses 270 square kilometres (100 sq mi). The earliest sign of human life in Portugal is the 400,000 year old skull discovered at the Cave of Aroeira in 2017. The territory of Torres Novas was settled as early as the Paelothic in areas situated along the margins of the carstic network of the River Almonda, such as the grottos in Buraca da Moura, Buraca da Oliveira and Lapa da Bugalheira. During the primordial period before Roman occupation, there were various villae that were populated in the region. Vila Cardílio, a Luso-Roman settlement was occupied in the first or second century A.D. Along with Avita, archaeologists discovered coloured mosaics, coins, sculptures and Latin inscriptions, where one was inscribed with felicitous remarks to the villa da torre (town of the tower), an expression associated with the plausible origin for the toponymy Torres Novas. Following the 12th century, the territory was known as Turris began to develop into its actual limits, with the expulsion of the Moors by forces loyal to 1148. The foundation of the municipality was attributed to the foral issued on 1 October 1190, by King Sancho. The castle which had, by that time, been in ruins was reconstructed by King Fernando, to halt Castilian forces during the Iberian wars. During the Middle Ages, the territory grew demographically and economically, receiving a Carta de Feira (authorizing a fair for this market) in 1263. The lands of Torres Novas passed into the possessions of Queen Isabel of Aragon in 1304 (who was transferred into her title by King Denis. In the following years, Torres Novas was a meeting point for sessions of the Cortes, and historical points in the kingdoms history, like the wedding between Infanta Beatriz and Infante Henrique, children of King Fernando I and King João I of Castilo (in 1380); the establishment of regency of Queen Leonor of Aragon Aragon (due to the death of King Edward I), during the reign of Afonso V (1438); and the decisions of the Cortes, which gathered intermittently in Torres Novas, to manage the Kingdom's issues (1525). Isabel of Avis was the donatário at the first half of the 15th century, receiving a new foral, during the reign of Manuel I of Portugal (1510). In the following decade, John of Lancaster was given the title of the first Marquis of Torres Novas, along with the Duke of Aveiro (which were both extinguished in 1759, following the attempted regicide of Joseph I, associated with José Mascarenhas da Silva e Lencastre). The monarch survived the attempted assassination. The king's daughter later conceded a license to Henrique Meuron and David Suabe to install Fábrica das Chitas (1783), which was later destroyed by General Massena, during the third French campaign along the Iberian peninsula (1810). The economy within Torres Novas continued along the 19th century, with some successes and failures: the founding of the Fábrica de Papel do Almonda (1818); establishment of the Companhia de Fiação de Torres Novas (1845); the creation of the transporter João Clara & Companhia (Irmãos) Lda. which, at the time of its nationalization (1975), was domianted by Clara Transportes - S.A.R.L.. The inauguration of the raillink between Torres Novas and Alcanena occurred in 1893, and was one of the most curious episode in the business and troubled history of the area. The municipality of Torres Novas, situated in the Médio Tejo subregion, with its neighbours Entroncamento, Tomar, Abrantes, Ourém and Fátima. Four of the parishes were included in the city of Torres Novas. The union of Torres Novas (São Pedro), Lapas e Ribeira Branca concentrates the majority of the people of the municipality (over 8400 inhabitants), in contrast with the parish of Zibreira (with approximately 1000 people). The largest parish, with an area of 40 square kilometres (15 sq mi), is the Torres Novas (Santa Maria, Salvador e Santiago), and the smallest is the parish of Meia Via, 4 square kilometres (1.5 sq mi). The small size means that it is the largest by density, with 395 inhabitants per kilometre square, and eight times the density of the smallest, Chancelaria. The present president of the municipality is Pedro Ferreira, elected by the Socialist Party. The village of Almonda within the parish of Zibreira is noted for the Aroeira cave where the 400,000 years old Aroeira 3 skull of Homo Heidelbergensis was discovered in 2014 - The oldest trace of human history in Portugal. Renova – Fábrica de Papel do Almonda, SA, a well known paper company, is based in the municipality, as well as the Companhia de Torres Novas, a textiles company. The municipal holiday is Ascension Day. There are Municipal Museum Carlos Reis, Agricultural Museum of Streams and Humberto Delgado Memorial House in the municipality. ^ Diário da República. "Law nr. 11-A/2013, pages 552 121-122" (pdf) (in Portuguese). Retrieved 3 August 2014. ^ Joan Daura et al. 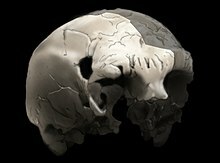 : New Middle Pleistocene hominin cranium from Gruta da Aroeira (Portugal). In: Proceedings of the National Academy of Sciences (PNAS) Online pre-release of 13 March 2017. ^ "Património artístico e etnográfico". www.cm-torresnovas.pt (in Portuguese). Archived from the original on 2017-10-12. Retrieved 2017-10-12. City of Torres Novas (2006). "Fundacão de Torres Novas". Archived from the original on 2007-01-19. Retrieved 2007-01-25. This page was last edited on 5 November 2018, at 14:52 (UTC).